HamScope is designed to run under Windows 98 and NT, and requires a 133 MHz Pentium-class or better machine. 16 bit SVGA color (or greater) is necessary for the panoramic waterfall display to function correctly. Users have reported that HamScope generally works fine on Windows 95, ME, XP, 2000, and perhaps others. I will not promise this, as I cannot test it across all systems of interest. If you run Win 95, you will likely have to install Microsoft patches (Year 2000 fix and the OLE patch, as a minimum), to get it to work. Please visit the AXCEL216 web page for more info on Win 95 and OLE patches. HamScope seems to work on Windows XP at some reasonable level, although it is not tested or supported on XP. There may be remaining issues with saving window size settings and some users report occasional problems with communications with the MMTTY RTTY engine. Support for Windows Vista and newer variants is not planned at this time. The program consists of a single executable file "HamScope.exe." This file can be placed anywhere, but it is probably best to create a new folder (directory) for it ( C:\HamScope\ for example). If online help is desired, the files "HamScope.hlp" and "HamScope.cnt" should also be in the same directory. Simply unzip the HamScopev156.zip file in your chosen directory to perform the default installation, or run the self-extracting HamScopev156.exe file. If you wish to use RTTY and ASCII modes in HamScope, you must also download JE3HHT's MMTTY RTTY Engine , and copy the mmtty.exe file to the HamScope folder you created. Also, to use either HF or VHF PACKET, you must download and configure SV2AGW's AGWPE Engine in the HamScope install folder. 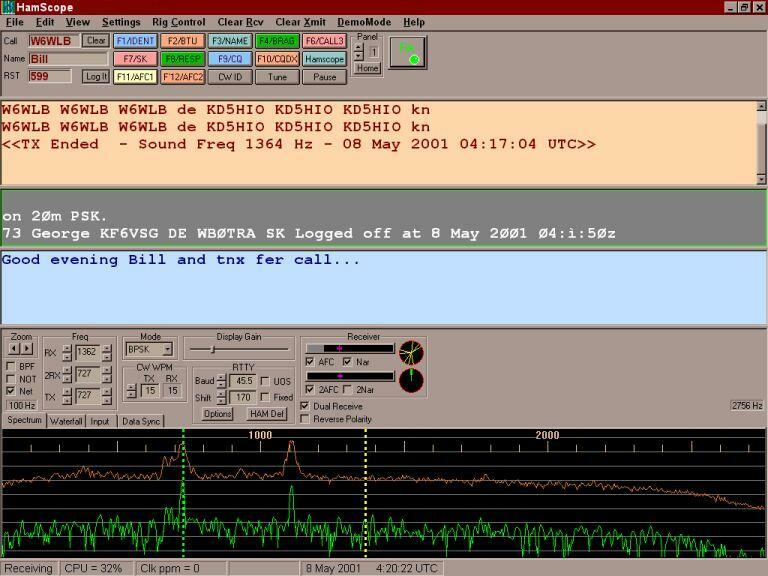 Please see the Sound Card Packet Site, by Ralph Milnes KC2RLM, for more info on packet operation using AGWPE and HamScope. Once the program has been run once, it creates a "HamScope.ini" file in the Windows directory (usually C:\Windows). MMTTY also creates a couple of files to store its settings, if you use RTTY. Likewise, AGWPE creates files to store its settings and configuration parameters. These files store the current user program settings each time the program exits. Windows will also create a few other files if Help is used. Download Spanish help files (HamScope v1.4 zip file archive). Thank you Antonio EA1MV for your translation. Download Italian help files (HamScope v1.4 zip file archive). Thank you Edoardo I5PAC and Antonio EA1MV for this translation. eliminated HamScope.ini file in system directory. Moved all configuration data to the registry under HKEY_CURRENT_USER\Software\ to support some use of the program under Windows XP. moved "Use LSB" to main window, renamed to "Reverse polarity"